The Trainer Jockey Combo Stats report shows what an excellent record Ger Lyons and Colin Keane have together at Dundalk over the past year. They have managed to have 20 winners (29.85%) and 39 places (58.21%) from 67 runners, for level stakes profits of 9.96 and 18.56. This has also produced an Impact Value of 3.59, meaning they are more than three and a half times more likely than average to have the winner. They have four runners together at Dundalk today, and it is Silk Cravat that I am going to be concentrating on. Silk Cravat has been in good form recently, with a win and two places from his last three races. He raced on an artificial surface for the first time on his penultimate start and appeared to like it. He was second over course and distance last time out in what was a stronger handicap than todays. He has been raised a further two pounds for that second place, but it looks as though they may be plenty more to come from his on the all-weather courses, and I expect a big run from him today. Ger Lyons' horses have been in great form of late, with 11 winners (25.58%) and 19 places (44.19%) from his last 43 runners over the past month. These have produced an Impact Value of 2.72. He also has a strong long-term record here at Dundalk and does particularly well on the all-weather courses in general. Colin Keane has been riding with plenty of confidence over the past few weeks and is 9/41 (21.95%) for the last 14 days for 3.82 points and an Impact Value of 2.33. 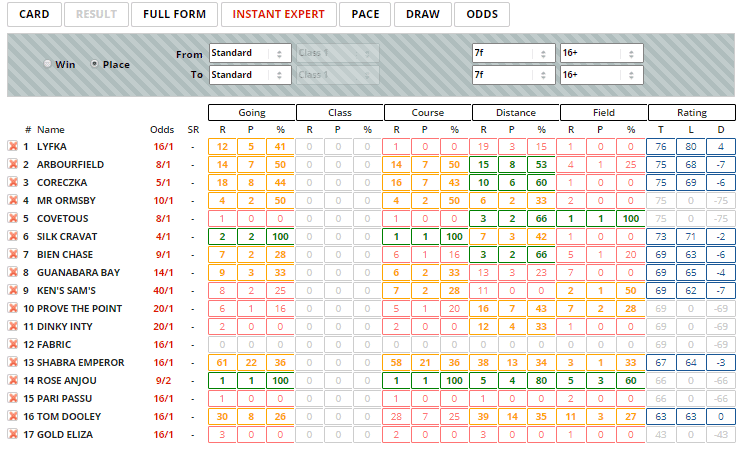 His strike rate here at Dundalk over the last year is better than one in five, and he is showing a level stakes profit of 14.29 from 182 runners. Silk Cravat looks reasonably well suited to today's conditions, as the Instant Expert report shows him with two sections of green and one of amber. He is only two pounds higher than his last winning mark as well. Rose Anjou is the runner that really stands out in this report, with four sections of green to her name. She is the current favourite at around 9/2 and could prove a big danger. Early leaders here over this distance have the best record, with 17.61% of them going on to win the race for a small level stakes loss. The Pace report shows that there appears to be absolutely no pace at all in this race, with the majority of the field usually happy to bide their time and sit in mid-division. This may well lead to a falsely run race and a dash for the line inside the last quarter of a mile. 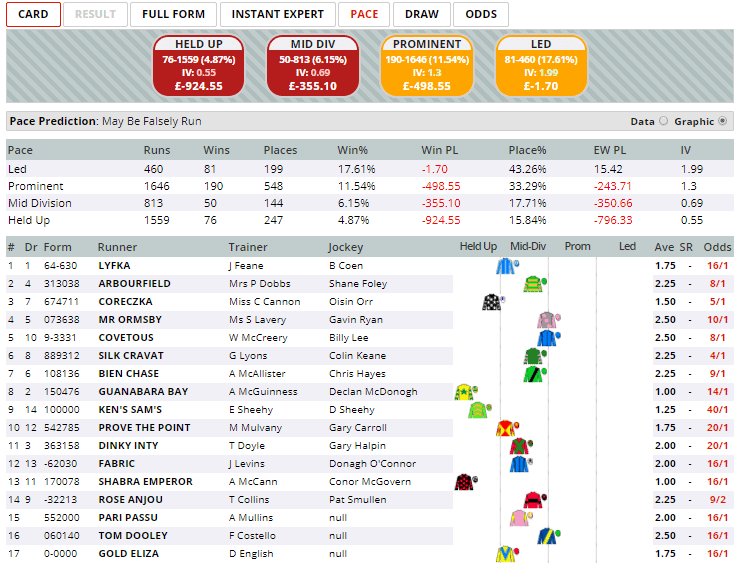 Click here for the 18:25 at Dundalk.